Digital wealth management solutions democratise finance by making investments accessible to younger professionals and the larger middle-class. They make tailored investment solutions and access to highly sophisticated asset classes available to (nearly) all. Indeed ‘robo-advisors’ charge low fees and have no (or low) minimum assets requirements. In the coming years, a larger population could benefit from similar financial returns as those received by high net worth individuals. Over the 20th century, finance has become one of the leading drivers of inequality. Atkinson et al. (2011) have shown that large wealth holders have access to investment products with significantly higher financial returns than mainstream products accessible to most. In his Capital in the Twenty-First Century, Piketty (2014) outlines the evolution of wealth inequality over the last three centuries. Piketty finds that the rate of return on capital has been significantly greater than the economic growth rate and, as such, the income from labour activity. Capital investments play a critical role in augmenting the wealth of the wealthiest, thereby increasing inequalities. That situation is reinforced by the fact that an increasing share of wealth is inherited, and inheritance itself is unequally distributed. Wealthy individuals have access to a wide range of investment opportunities, including investment into alternative asset management (e.g. hedge funds) whereas small investors are typically redirected to more ‘vanilla’ investments (e.g. bank deposits and government bonds). The 2017 IMF Annual Report emphasises that rising inequality is one of the most pressing global issues, and that it impairs sustainable growth. According to the IMF, per capita real income of the top 1% of the populations of advanced economies has grown by 282% between 1980 and 2012, whereas per capita real income of the remaining 99% of the populations has only grown by 144% over the same period. Notes: The data refer to household net worth, assets after debt has been subtracted. Income reflects gross aggregate national income. Source: World Wealth and Income Database. An important component of wealth inequality relates to income inequality. Over the last decade, the income of the middle class, which represents the largest share of the population in developed countries, has stagnated or declined (Laboure and Braunstein 2016). According to a McKinsey study (2016) only a third of households in developed countries have seen their incomes rise between 2005 and 2014 while two-thirds saw their income stagnate or decline. Robo-advisors refer to algorithms that offer access to diversified investment portfolios tailored to individual needs. Robo-advisors provide quality financial services and access to a diversified pool of financial assets at lower costs than human advisors. They have the advantage of economies of scale, as one computer algorithm advises many clients. Thus, over time, as robo-advisors acquire more clients and accumulate assets, their fees should fall even further by economies of scale. Traditional asset managers are expensive and only justified by significant financial assets, whereas digital wealth management solutions, such as robo-advisors, are affordable and can be justified even with little money to invest. Traditional asset managers often have minimum asset requirements of $500,000 or more, with fees ranging from 1-2% of the assets under management. In contrast, robo-advisors have no or low asset requirements and their fees range from 0-1%. Beyond that, some robo-advisors provide attractive returns in line with classic wealth managers. In 2016, the portfolio return of the eight largest US robo-advisors ranged from 5.55% to 10.75%, according to BackEnd Benchmarking. By comparison, a ‘typical’ benchmark composed of 60% fixed income (10-year US government bonds) and 40% equity (S&P 500 as a proxy) yielded a return of 5.9% in 2016. Robo-advisors have the potential to democratise finance, as until now a large population has been excluded from investing into financial markets. However, in order to do so, several hurdles need to be overcome, including financial literacy, regulation, cyber security, and notably the potential conflict of interest of large managers moving into the robo-advisors market. Education is key and required to shift middle-class minds towards investing and long-term financial planning (retirement, children’s education, etc.). A larger share of the population needs to get acquainted with finance and investments, its risks and its benefits. The solution will probably come both from the private sector (by simplifying the process and reducing fees and the initial capital required) and from the government (by educating citizens about financial principles). The largest unnoticed risk is the entrance of traditional wealth managers into the robo-advisor market. Robo-advisors were originally independent digital wealth management platforms with no conflict of interest. To increase their exposure to millennial customers, traditional asset managers have recently rushed to build their own robo-advisors or acquire existing digital platforms. For example, in 2017, prominent US financial institutions – such as Goldman Sachs, Wells Fargo, Bank of America, and Blackrock – have acquired or created their own robo-advisors. With more and more banks and investment firms acquiring robo-advisors, their independence could be at stake, as investment opportunities on these platforms might be reduced or skewed towards the products of these institutions. Retirement planning and the management of pension savings could be a promising catalyst for robo-advisors, especially in countries that lack universal access to retirement plans, such as the US. Educated millennials could also be a promising customer segment for digital wealth management solutions since they are financially literate and comfortable with technology. Today, robo-advisors manage a combined total of less than $100 billion in assets (Statista 2017). This represents only a small fraction of the $20 trillion of assets invested in the US financial market. Experts expect the industry’s growth to be substantial, though estimates vary considerably, ranging from $820 billion (Statista 2017) in 2020, to $2,200 billion (KPMG) and $8,100 billion (BI Intelligence). Such a growth would lead to further scale for the larger players and potential to advertise and educate a larger audience. It could lead to a virtuous cycle and deliver on its disruption promises. A bigger access to financial investments could become a critical tool for reducing the wealth inequality gap. Atkinson, A, T Piketty and E Saez (2011), “Top incomes in the long run of history”, Journal of Economic Literature 49(1): 3-71.
International Monetary Fund (2017), Annual Report 2017: Promoting Inclusive Growth. KPMG (2016), Robo advising: Catching up and getting ahead. McKinsey Global Institute (2016), Poorer than their parents? 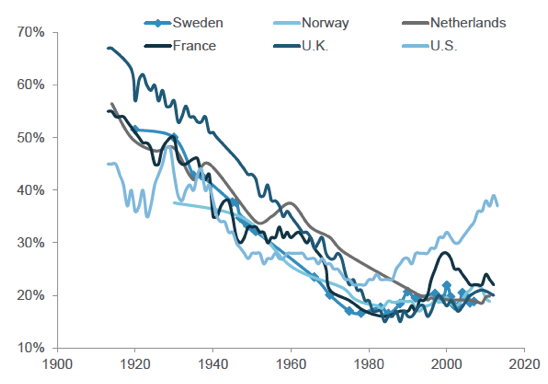 Flat or falling incomes in advanced economies. Laboure, M and J Braunstein (2016), “The Great Stagnation”, Global Policy, 11 October.